I noticed that in the initial stage of the instruction and working process there was no significant difference between those two groups. The big difference was in the learning curve. The question arises for me, why both groups had a common ground in this stage, because we didnt occupy ourselves with subjects of knowledge but with objects of reality; that means, how we see objects and how we describe them. In each school I had a fully equipped workshop, including small machinery. My method was to have the students decide what object they would choose as a work project. They were asked to make their own decisions. That is an uncommon practice in the framework of a school, but was very effective in terms of learning and creating a workplace-discipline. All the common disciplinary problems of the school evaporated. I shifted the responsibility for proper performance from the teacher to the students. All that is written here concerns about half of the school population. When in the text the term students is used, it refers to half of the population in each class. Also, all that is written here needs verification by systematic scientific inquiry, which I was not able to do. To the best of my knowledge, I describe here one of the main obstacles in the process of education of ordinary students in secondary schools. Proper valuation of my findings, and then acting accordingly, could improve the achievements of many ordinary students. There is an illusion that the present school system fits the needs of the average pupil. I personally doubt this, because 50  60 % of students demonstrate that their achievements are less than average. In fact, it is common knowledge that with the transition to a higher school class, the studying is going to be harder for most of the students. That is in sharp contrast to every other known activity of men. It is a general rule that for normal people the performance in every field of activity become easier and automated the longer they occupy themselves with a given activity. Why is school different in this respect? Two reasons are normally given: adolescence, and the gradual increase in the difficulty of the learning subjects. It sounds convincing. But I doubt if it is the whole answer. Disciplinary problems disappeared, but learning problems arose, especially in the initial stage of planning, and those problems didnt go away in the different stages of the working process. It can be assumed that a child, introduced to new surroundings, needs time to adjust himself to the unknown condition. After a while, however, I found out that this stage of creating smooth communication with each pupil had an inherent obstacle. A portion of the children could not convey to me their wishes. That sounds strange. of course they could say,  I want to make a model airplane; I want to sculpt a horse and so on. But how does an airplane or a horse look? What are the parts, and what are the proportions and the relations between the different parts of small objects? The children had before their eyes a huge collection of executable objects, a collection of books and pages with small wooden objects, some of them in plain photographs, some of them in simple drawings. In addition, part of the desired object has been seen elsewhere; the objects had to be constructed from the memory. The contents of the childrens memory were poor and insufficient for planning. I found it necessary to initialize the work-process by asking the students to make a sketch. Any sketch that could give information about the students real intentions would do. I thought at the same time that the sketch could prime technical thinking. The children refused to cooperate, however, totally and without exception. This problem of how to see or to plan an non-existing object was not restricted to the initial planning phase of executing, Rather, it repeated itself in each stage of the working process, in a way I will attempt to describe in detail. If my descriptions seem to be unreal or exaggerated to someone not familiar with the proceeding of a workshop, I will add in short another issue that may make the impression even worse. Reducing from a wooden block (sculpting). 1.) 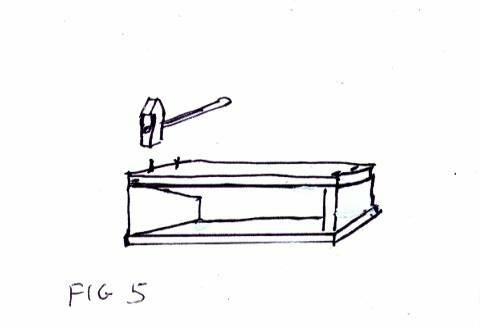 I noticed that children could not properly describe an object, and instead preferred to start the working process by locating the door or the lid before considering construction of the box itself. 2.) Children had no idea how to use numbers. No connections emerged between the math studied in the classroom and the reality manifestible in centimeters. This is a pity, but acceptable. Maybe practical training later in life can learn this. Children could never tell me what should be the desired size, say of a shelf, in terms of centimeter; it was my task to question them and make decisions, such as what width or length would be appropriate. Most children in this age range can use the number system and can calculate by multiplifying and dividing. They could not, however, do it with more complex numbers that didnt divide smoothly. To divide a number like 37.5 centimeter by two in order to find its middle point was always a problem that required my help. 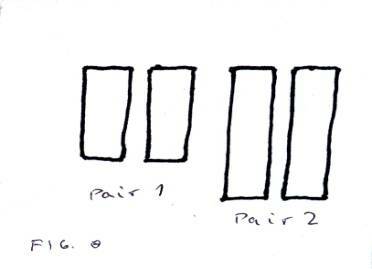 If I suggested dividing it into two identical parts without the help of a ruler they were perplexed. I demonstrated how to do it by taking a string and folding it in two or three. That was something outside the mathematical range, they learned, but they got the point quickly. Then I found out that a small number of the children had a real problem. They couldnt measure a square; they never got the common notion, used almost unconsciously by everyone, that we project onto our space and onto every object a lattice of coordinates that meet in angles of 90degree. This practice is so obvious to people growing up in a developed society, so common, that it not needs to be explained., but a small portion of students who attended the classroom for several years and had not internalized this basic fact. It may be that their image system projected three-dimensional views in a distorted perspective relationship. I dont really know whether such children need special training in order to synchronize their image system to the collective accepted system. Needless to say, such students could not master mathematics even in its rudimentary form of counting and basic mathematical operations. My easy answer: If you do as instructed, you always will get the desired result. That is a practical answer, but it didnt answer his question at all about the nature of the procedure. J.Brunner (1965) wrote that a teacher has to be able to answer students questions in an intellectually honest and correct way. In this case, I could not. It took me a long time to figure out the answer, which is as quoted above: We use Euclidean geometry, which projects onto our field of view a grid of parallel lines, and this grid projects the lines into our eyes in a way that help us to orient ourselves and behave accordingly. In the geometric theory, all those lines meet in angles of 90 degrees, even if we conceive them in a perspective view, which projects a virtual reality with virtual lines on our retina and brain.. The ten-year-old boy, who posed the question probably had a distorted projection or he a different philosophy of visual perception. Proper measuring is a problem for all students but can be learned to a certain degree without many problems. Only students who learn well can obtain the degree of accuracy needed for fitting complex or delicate structures. The most annoying problem was always the construction of a right angle. The problem has to be divided into two parts: grasping the importance of the right angle and manually executing a right angle. The core problem in woodwork is to overcome this obstacle. A pair of two identical wooden parts constructs a box. If one of the 8 sides in the corner deviate from 90 degree the box will be distorted. I found that all the work would be in vein if I will let the children cut the wood by themselves. They never attained a right angle, or two identical pieces. Machinery didnt help much. The common solution  the teacher is doing the actually cutting on a precise electrical saw bench. That was not my idea of a proper work process, but was the only available solution. Wood is a comparatively flexible material. Applying pressure can repair small deviation from the right angle. Three years I tried to force children to stick to right angles. I tried to work with rigid plastic sheets (Perspex) instead of plywood. If a box made of rigid plastic is not executed in right angles, the sidepieces cant be glued. This experiment was a complete failure. Children in this age group could not bring themselves to cut and handle parts of the objects in a proper right angle. I gave up and continued to work with wood. But that is not the end of the story. The next obstacle to make a box was much more significant. This stage revealed something much more fundamental. We proceed from the second stage of preparing 4 sides of a box to the stage to link those pieces to a simple frame. I will describe what happened in most of the cases, where perfectly normal and fit children were involved. They prepared those 4 pieces in an acceptable manner. They knew by their own experiences that they prepared 2 identical pairs and got my OK to proceed by nailing the pieces together. Simple? Not! This is an exact repetition of J. Piagets experiment with very small children. He could proof hat small children acquire by a natural trial and error process, without verbal instruction, the notion, that the amount of liquid will not change, regardless of its form or containing vessel. This situation, as described here is a proof that was learned in early childhood cant be transferred to another situation. It proofs that even simple notions like the ability to distinguish correctly between constant and changing objects in visual representation have to be learned again in each stage of growing process of children. This situation repeated itself over and over again and without my help, children couldnt continue. I remember vividly, how a 16-year-old boy was in this situation. His 4th piece was to long. He toke a hammer and axed away the protruding wood. That was an extreme reaction and it took me some time to figure out why he did what he did. He wasnt the aggressive type, but he came from a social milieu where it is custom to solve problems by using force. He simply had no other means to solve problematic situations. Proper training of the image system would prevent such situation. If childrens image system is exposed to 2-D material only, as in a common school, it is reduced to evaluate the front view only. No one of my students had the ability to remember, the former situation: having 2 identical pair of wood and apply it to 3-D situation. 3.) What size of nails to use? Easy to solve by telling the pupil take nails no. X. But that is no proper teaching. How can you formulate the answers in a way that will help the pupil to make his choice in a similar but different situation? This problem is connected to another activity of Depictivness of a practical situation. Nobody is going after his daily business with a measuring instrument in his pocket. But proper estimating is part of daily life. Each child learns quickly to estimate distances as part of leaning to walk erectly. Children learn to estimate distances by play, mostly ball playing. School should concern themselves to build bridges from the natural acquired abilities to estimating distances to estimate and handle abstract and semi-abstract issues. Proper estimating a task, concrete or abstract has to be formed in a proper medium of instruction. A proper estimate of effort and means to execute a practical task or to execute an academic task is the first step of a planning process. Proper planning is a visual and imagery process, prior to abstract thinking processes, which are better to fill-in the different cells of content, like the structure and the content of an Excel worksheet. The list of failed task is endless, but without a proper visual outlay no task will be executed properly. Such visual outlays and schemata can be acquired by simple procedural learning. The computer programs that assist such planning are not more than a complex visual form, specializing in a certain field of activity. They fill-in the vacuum created by the absent of the ability to organize and form a visual representation of what is laying ahead. Because the ability to estimate is vital, we need tools to handle the reality, where exact data are absent, (Von Bayer 1993) give such a marvelous description of how science works by telling, how E.Fermi, the Italian physicist took an estimated account of the power of the first detonated Atomic device by using not more than some pieces of confetti. Cutting a straight line , cutting a circle. Children not always can use a handsaw properly. They have not enough control and power to move their forearm in a straight line. To obtain movement in a straight line we need to make so many adjustments in the movements of the different joints and parts of the shoulder, the arm and the wrist that it cant be expected from children in this age. The easy solution  use of an electrical jigsaw. The jigsaw was the main instrument of woodcutting. But mechanical saws work in an opposite manner of the arm and hand. They can cut in a straight line only. Every deviation from the straight line results in a stalling of the blade. To overcome this obstacle it is necessary to plan the approach of using the saw for all actions, that are not executed in a single straight line. A situation, that repeated it self was cutting a circle from a rectangular piece of wood.. The common approach is to make a short, straight cut from the edge of the plywood to the circumference of the circle. But from here you cant continue. It is impossible to force the saw to make a 90-degree bend. The solution is easy if people are trained properly to use their visual representation for executing a task. To cut a circle is possible only by imagining a couple of tangenting lines, which touch the circumference of the circle. (Fig 6-7) For children this was one of the riddles of the working-process. Only an experienced carpenter can read such drawing, calculate the necessary overlapping, in the corners where the parts meet. But the exact joinery is done by personal knowledge acquired by the craftsmen. So, it was part of my work to give detailed instruction. Never the less, in cases of making simple boxes, what has to be calculated is a simple reduction of the thickness of the wooden part, from the lengths of the joined part, this for obtaining the desired measure. Otherwise the thickness of the parts will add length to the whole box. It could be expected from a student to master this simple practical Geometry. After some experience most students got the point, but not always. The matter was more complicated if the box or a similar object was not a straight square. I know that students could not calculate properly such objects and make a simple list of the measurement of the required part. This part demanded investment of time and lengthy discussion, again lack of imaging and analyzing the composed object. But the real obstacle was in the next phase of the task. The necessary wooden parts are ready, joints are made, and all the parts lay on the bench. How they fit together? My students couldnt figure out how parts laying on the bench could be assembled in the different directions of the view field; that means in their proper place of the whole object. 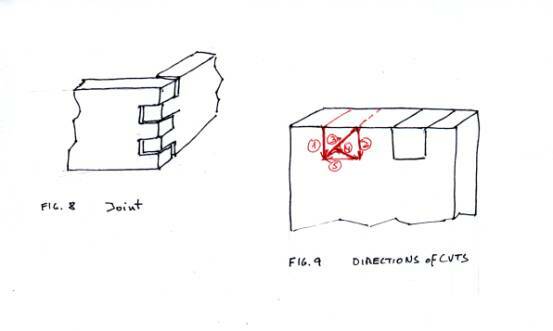 If it was necessary to make a simple wooden joint and during the working process parts changed their location it was a great effort to imaging how they would meet in a different direction. This was a problem that could not be easily eliminated, because they had not the necessary mental abilities to rotate and change the position of the parts and assemble them in their mind as parts of the whole. In a school this lengthy process of preparing all the parts of complex structure is interrupted by the restricted time devoted to each lesson. Suddenly the lesson is over. The results are that at the beginning of a new lesson the parts lay on the bench and the whole process of arranging the parts in the right order and direction for finding, what meets what and where, started from anew. I can only stress again my point. One matter is to obtain orientation in an existing environment and outlay. All the research in orientation, in the way different people act according to their personal mode of orientation is done in labs in a preconstructed physical outlay. Im dealing with a situation of creating a new outlay, visually and real, from different parts, each of them has each own dimension and they have to fit together and create the desired (imaged) object. The joining process, to find the right angle in both joined pieces is not easy. The two adjoining pieces have not the same (perspective) view in two possible situations. Laying flat on the bench in random direction or joined in space on their proper location..
-The fixed working direction of the machine. -The direction of seeing the angle, which change instantly from the frontal view to another view-direction by the necessity to hold the work piece in not a frontal-view direction. The steeper the angle so greater the difficulty to execute properly. In many years of practice I didnt find a student, which could properly sharpen a wooden stick on a sandpaper machine. The fact that the difficulties of students to handle properly 3-D real objects and to create simple objects that have to be assembled from some parts have a hierarchical character, has some significance . First of all is the overall inability to imagine correctly a simple object, then comes the problem, that a object is grasped properly if it can be imagined from several advantage- points, not only from the front view; To create pivot points for mental operation, to set a starting point for motor execution; lines and directions; coordination of direction, directions of the object; directions of coordinating hand object and tool and not a easy part to know the effects of proper applying of force and timing. Im not qualified to make statements about brain functions and the learning process. Sot I will give only a crude sketch of the results of my observations. I can say without restrictions that there exists a correlation between the abilities of students to describe correctly the objects in their mind, to manipulate the parts in the different stages of the working process and their performance in the classroom, especially in mathematics but in other subjects as well. Without having any specially knowledge in psychology I was always able to give other teachers correct information about what a particular student can learn or not. Those correlations existed even in students whose measured IQ was above the norm, but had learning problems nevertheless. It is common knowledge that a portion of gifted children tend to unequal distribution of their capabilities. I learned to manipulate the failure of students for my purposes (be able to divide my attention between the students.) I had always the strange feeling to have a look into the working process of somebody others mind. And on pp 20 : Intellectually challenging opportunities for children in primary school invariably require action-orientated activities in physical and concrete thinking. My conclusions, found by observation of childrens action, are identical to their findings. I will describe how objects are handle by 12  15 year olds in a faulty way for lack of internal imagery. Those faults are primary in structure and very important for handling abstract contents. What really is important is the ability to handle those objects in a dynamic and effortless way. To acquire this ability is the most important phase for students, who are not inclined by habit or inborn constitution to read a lot by themselves and acquire abstract contents and subjects as natural function of their mind. Low-level abstractions are fundamental in themselves and prior to high-level abstraction. But the core and the essentials of my teaching was not to create wooden objects, or to recognize the underlying structures of geometries and perspective, but to open a window to higher mental activity by assisting children to act intelligently even in a simple concrete situation. The behavior of students with learning difficulties, who had no access and experience in high-level abstraction, can be strange. Always they were eager to act, to do something. But in this age they were depended totally on step-to-step instruction as consequence of their school experience. They all were very good in dismantling. They were unable to create a structure from parts, so they went the opposite way. One extreme case is vividly in my mind. A small group of boys dismantled an abandoned and hidden-from- sight tractor to all its parts, to the last screw! Not a small endeavor. In another case a 12-year-old boy got the electrical parts for his wooden lamp that he had made. He didnt know what to do with them exactly, so he dismantled every screw and even the wire he stripped to each layer. Children depend for their development on this basic mental system, to perceive and react, that may be a genetically and biologically one, developed during the rise of the human species. Children relay heavily on their visual input, and learn with little outside help to react quickly and efficiently. To get perfection in this realm is their main occupation in childhood and sometime it is connected to visual fantasies and other contents of their mentalities. But they dont acquire knowledge by their own and so they go to school. They start studying verbal functions, reading, writing, grammar, language, meanings and syntax etc. They acquire knowledge in many fields, especially in the realm of social sciences. Only a part of the students can express and formulate their thoughts properly after 12 years of study. The knowledge they acquire at school is not properly organized. Each piece of knowledge and information is stored on his own. The relations and connections created by the innumerable bits of knowledge are weak. Relations and connections have a strong spatial content. Those structures have to be learned and assimilated too. Knowledge is superficial and unusable without structure. Verbal training cant do this easily because of its 2-Dimentional character. This quasi-visual thinking has to be learned in its proper realm, in a surrounding that trains manipulation of 3-D objects for a start and then uses this base as a foundation to handle knowledge in general. Part of students need special training to create a biofeedback system for handling knowledge in its proper structure. Its like we have many books but no catalog to access their content. The associations of such students are ruled by sound bites. (Ask a regular student, what subject he learned in the former school year?) He will not give an answer instantly. The first stage is achieved by proper depicting of the outer world through the visual system. The second stage is achieved by manipulating the seen objects in the mind. The third stage is the discarding of the visual crutches and handling knowledge instantaneously, automatically. In other words: obtain control and mastery. By this mechanism every field of knowledge is acquired, from simple automated motored performances to mastering the specifics of a profession. Proper use of ones knowledge depends on creating a process of thinking that is overextending the basic biological functions, like seeing, orientating, catching and aiming. Executing simple manual tasks may be the border area between the biological-genetically apparatus of man and higher learning, The basic principles of such an instruction system are not formulated yet. There exist a gap between all learning theories and their proper application. The attempt of our educational system to teach mathematics with the help of concrete elements (a box containing wooden units in different color) was abandoned. A number cant be both, abstract and real in the same time. Each man, even uneducated, can act in a 3-dimensional reality, that is part of his biology, but the proper understanding of dimension is no more than 400 years old. The thinking process of man is not restricted to substances, that can be or have to be depicted in his own mind. But certain actions depend on the ability to predict and to plan movements for meeting vital needs. All body movements, even if they are fully automated, need time and control by a mental apparatus includes on his core a phase of estimation of direction and targeting. ( Fitts and Posner 1967). Between the perception of a sign and responding to it, is a time delay, which vary from man to man. Proper execution of a motor movement contains a phase of coordination, which is done with the help of short-term-imagery and control system. (Pribram,Gallacher,Miller 1970)The important point for me is that proper execution of motor movements includes a short phase of imagery. If the individual is sure of his movement, this phase is shortened if he is unsure this interim phase is longer. The fact that imagery plays a role in executing and controlling movement can be confirmed by the fact that an imagery movement of a body part and the real movement need the same time for execution. The brain mechanism for real movement and imagery movement uses the same nerve path-ways. The execution of real movements and imaginary movements requires the same time span. This primary system of movement is the main instrument of children to meet the world. Most of them, without a source of stimulating other, higher mentally needs, will train their bodily function through an almost endless play. Because schools are instruments of educations, the development of movement-depend function plays a secondary role. This sounds convincing and is common knowledge. This disregard from childs basic developments-needs has a price, paid by the child and the dysfunctional school. Schools are in principle vehicle of 2-D presentations to the mind through flat surfaces. (Books, blackboards and copybooks and paper.) Body movements of all kinds are executed by amechanism, which needs the elaborating of 3-D visual input. The only instrument that we have to refine and to control this coordination between eye and body is the hand. The hand is the instrument for training and possibly enlarging the eyes visual capabilities. I found, without any reservation, that for the main body of students, learning is possible only by a gradually passage from a mental process based on real, depictable objects to abstract thought. It is not the depictable object, that is important, but the ability to manipulate it mentally. In the moment this stage of mental development is achieved, the image and the imaging process can be forgotten, but the manipulating abilities remain. I repeat this in another way. The content of our mental system is divided between depictive contents, real objects and pictures, (Wittengenstein 1922 pp 30-43 ) and verbal contents that can be grasped and understood with the help of other more simpler words. These notions have a life of their own, they change their meaning and have to be explained and adjusted all the time. We have a way as humans to deepening our understanding by using images and words and sounds in a way, which converge in our mind and are able to create a virtual world beside the real world. In this context I relate to the realm of mental imagination as the part of the mind where everything is converging and everything is elaborated before creating responses. This is true for motor action too. For many children intelligent and creative motor action is the first step to achieve more than instrumental, formal education. It is not in the realm of this article to go into the details of this basic biological system. I will tell only what I found through observing my students, especially those who had not a smooth executing system. I found that the coordination system needs adjustment in a not small part of children. The only way to refine motor eye-hand- coordination is done through guided training. What is overlooked is the fact, that the only way to train the eye, to give reality, control and feedback to its image system is the hand. The other way to obtain the same goal is to perform with closed eyes, to train executions of bodily functions by imagining them. These two contradicting modes can complement each other. It is not enough to see for enabling intelligent execution. If the eye is not trained in manipulating real 3-D objects, its ability to do so will shrink and the depicting of the real world will be restricted to see a virtual 3-D world, which is in fact a 2-D world. In this virtual world everybody can move passively. This virtual electronic world is now ubiquitous. It did the brain one important service. It trained the brain to grasp images incoming in very quick intervals. That is the main difference in the perceptions abilities between the older generation and the new one. For those reasons I got the impression that half of my very normal students had a kind of regression in their visual input system, that restricted the visual input, that they could process to its frontal view input only. Every line that appears on the retina in an angle, as required by perspective perception, is seen but they could not make any mental operation with them. (Estimate, rotate and bring them in there final position, if some imagination or action was required) So steeper the angle to the frontal view, so bigger the difficulty to act accordingly. Without describing the basic working system of short and permanent memory (A.Lurie 1953) I will point to the fact that all methods of memory improvements use the existing imagery system as basic tool for attaining this goal. The imagery system is able to create a bond between abstract words and ideas and the virtual world, as seen by the eye and depicted by the brain. In other words: A good functioning imagery system is important for remembering, for learning. The method to achieve this will be discussed later. Can 3-D imagery be acquired by learning?
! )- Everyone learns to see by himself by a natural biological conditioned way. 2)- Handling reality-images has nothing to do with advance education, but in cases that a special occupation required a higher level of observance and analysis qualities. Artist of all kinds need such awareness in the visual realm just as poets and writers need it in their verbal realm. Those notions are partly true if students have natural abilities to learn in a abstract 2-D mode. Or to put it another way, a portion of children have a mental system, that response to teaching as practiced everywhere, This generates the illusion, that there are good students and not bad students. Today everyone has to be educated in a way, that in former centuries was the privilege of a part of the general population only. The ratio of 50 % of students, that have a problem with acquiring advanced education, is a constant, which appears in many publications on education. Humans have two perceptive mental modes; one inclined to hearing and verbal priorities the other one inclined to seeing and bodily executions. 3-D imagery can be acquired by all kinds of art education and guided imageries. Arts use imagination and motor action simultaneously. Today there is no direct connection between arts and general teaching and how it can serve the requirements of the curriculum. That is not only a matter of research it require a change in the general attitude and relation to this subject. It is assumed and taken for granted that arts are a desirable supplement to the school curriculum. Arts, proper incorporated into the learning process can be the base for learning abstract and verbal subjects. Art can serve this purpose if the proper taxonomy of its contents will be known. The emphasis has to be on 3-D media, but not exclusively. It is obvious that you can teach exact science satisfactory only with the help of a laboratory. So it should be done in all others field of knowledge. Today the trend in education is to introduce computers as part of the learning process. Knowledge is processed, like in assisted learning systems into small bits. But the computer screen reveals its content for a short period only; The computer can assist in procedural learning but a computer in the classroom is no substitute for building tools of thinking. The school supervising system is occupied with standardization of knowledge to synchronize the curriculum with the advantages offered by the computer. The knowledge of students is quantified by a list of items, which the students have to know and remember (at least until the examination). The Israeli Ministry of Education concentrates the knowledgeable Items to a list of 100 in certain subjects. But that is not enough to buy an entrance ticket to a college or a university. Universities do not accept the results of secondary education even if students pass the final examination successfully. Students are sent to a special course of Psychometrics. Why? In these psychometric courses students are trained to pass a number of additional tests. Those tests measure the different aspects of what is called IQ. This practice proofs that IQ can be changed and can be improved by specific learning. If a short preparatory course for college admission can have such an impact on all students, why then should schools not disregards the principles of those courses and concentrate on accumulation of knowledge in some subjects only, considered critically for general education. All the plastic arts can be the vehicle of training the imagination. Not all people have the same kind of imaginations or use their imagination in the same way. There are converger and diverger, ( Liam Hudson 1967 ) or according to A.Petrie enhancer and reducer. (A.Petrie 1975). There are children and adults whose imagination has no proper frame to serve specific purpose. A proper organized image system is a natural gift not given to everyone. I learned later that this problem of unorganized image system is the problem of many gifted children too, their mind works above average in many aspects but not in all of them. This fact points to another feature of the imagery system. The imagery system has to be seen as the central part of all the conscious brain activity in a given moment, every sensory input and every verbal and motor action is attached to this central part. I consider imagery as a pooling and testing system for achieving efficiency in action. Probably that is right, but not the whole truth. Knowledge and thought are interlocked mental capacities. The acquiring of knowledge at school is a process that enhances the thinking process in itself. The handling of 3-D objects in a process of creation helps to augment the ability to imagine and replace objects in your mind and in your view field. In his first stage this is a kind of pictorial thinking. This is one of the preferred pathways of young children to learn and internalize reality. It is used in preschool and early school as vehicle of learning. The same vehicle has to be used in higher learning as well but not by passive absorbing of graphical material. The goal should be to get access to a 3-D-realm, adjusted to the needs of students, which are over whelmed by the requirement of the demands of the higher school classes. Today schools have no facilities for such activity, except a few laboratories. What makes me claim that it is desirable and possibly fruitful to expose students of high school to creative activity in a 3-D medium is the dependence of a part of children to learn and act intelligently in concrete connection only. What the school lacks is an intermediary step to help students to achieve high-level abstraction by actions in the visual field. These are impossible in a school that is 2-D orientated in all its activities. A school deals with flat surfaces only. I know that my findings have a negative character; I have tried to demonstrate that students, which cant act in a 3-D medium cant learn easily and are dropping out from high school. I know that the exact data have to be assembled by systematic survey and research. So I have made an effort to build a taxonomy of mental capabilities as I observed in my workshop.